It’s a case of being ‘up before the enemy’ we’re told. “If you don’t snooze, you lose”. According to Matt Walker, professor of neuroscience and psychology at the University of California and author of Why We Sleep: The New Science of Sleep and Dreams, there are numerous reasons why people need to be getting eight hours of sleep a night, and several that stand out as being of utmost importance to innovators and leaders of teams. Sleeping enriches a diversity of functions related to learning, memory, creativity, decision making, and emotional regulation. So basically, all the important stuff your brain does. Sadly, two-thirds of adults throughout all developed nations fail to obtain the recommended eight hours of nightly sleep (which means that there is a 67% chance that you are one of them). Utterances like “I can perform well on six hours a night”, and “eight hours is a pipe-dream” are common. And I get it, I said the same thing for almost ten years, willing myself out of bed at 5 am for an early-morning workout, after having slept somewhere between six and seven hours. I’d judge people who slept until 7 am and write them off as lazy and undisciplined. During my twenties and early thirties, when I was more inclined to head out for a big night (I’m now 35 and such nights are now a rarity), I’d think nothing of waking up at 9am on a Saturday morning after having gone to bed at 5am, and venture out for a 10km run, thinking I was invincible and that it was the best way to recover and enjoy the day. I couldn’t fathom how my fellow revelers would sleep right on through to the mid-afternoon. But the science suggests that routinely sleeping less than six or seven hours a night demolishes your immune system and more than doubles your risk of cancer. And the thing about thinking six hours is enough is you don’t know you’re sleep deprived when you’re sleep deprived. The shorter your sleep the shorter your life-span. For many years, I pointed to the Bon Jovi song, “Sleep When I Am Dead” as an anthem of sorts, but if you adopt this mindset, Walker warns, you will be dead sooner and the quality of that shorter life will be poorer. The same goes for the old maxim, ‘live each day like it’s your last’ — well, I don’t know about you but if I lived each day like it was my last, it would very quickly be my actual last day. If you’re an innovator or executive trying to battle the afternoon crash by reaching for a cup of coffee, Walker warns us that caffeine has an average half-life of five to seven hours which means if you have a cup of coffee at 3 pm, you’ll still have 50% of that caffeine in your system circa 8 pm to 10 pm, so that difficulty getting a good night’s rest might have a lot to do with your mid-afternoon coffee. If you get 7 hours of sleep for an entire week, the effect on your body and brain is the equivalent of pulling an all nighter. How Do I Know If I’m Not Getting Enough Sleep? 1 — Can you fall back asleep at 10 am or 11 am after waking up earlier that day? 2 — Can you function without caffeine before noon? 3 — Would you sleep right on through your alarm clock if it failed to turn on? If so, you’re probably not getting enough sleep. NREM supports the storage and strengthening of new facts and skills. REM sleep connects those facts and skills with each other, helping us to develop a more accurate model of how the world works and become more innovative and creative. Innovation and creativity, after all, is a byproduct of associational thinking — connecting dots between disparate bodies of knowledge, and as Steve Jobs noted in his Stanford commencement speech, “you can’t connect the dots looking forward, you can only connect them looking backward”. 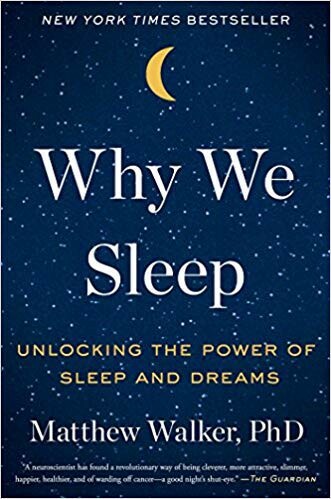 If you’re not getting enough sleep, all those dots you’re collecting through books, podcasts, blogs, conversations, lectures and so on, may go to waste if you don’t get enough NREM sleep (memory) or REM sleep (associational thinking), making you less knowledgeable and creative. REM sleep predominantly occurs during the latter portion of an eight-hour slumber. If you only get six hours of sleep a night, then you miss out on 60–90% of your REM sleep which can have grave consequences insofar as your creativity and mood is concerned. The lower somebody’s sleep quantity and quality, the higher their mortality risk and the worse off their physical health. Poor sleep has a strong correlation between depression, reporting less energy and suffering a decline in cognitive functioning. You can’t pay off a sleep debt by sleeping longer on weekends. The damage can never be undone. It is early night sleep rich in deep NREM sleep that provides superior memory retention savings relative to late night REM-rich sleep. The more NREM sleep you have, the more you will remember the next day. Even daytime naps as short as 20 minutes (hello Edison) can offer a memory consolidation advantage so long as they contain enough NREM sleep. Some of the greatest feats of transformative thinking in the history of the human race can be credited to deep REM sleep, such as the discovery of the periodic table of elements, which came to Dmitri Mendeleev in a dream. The ‘recycle rate’ of a human being is about 16 hours. After 16 hours of being awake at the brain begins to fail and after a first night of no sleep at all, lapses in concentration increase by over 400%. Sleep deprivation shows a 60% amplification in emotional reactivity. With a full night of plentiful sleep we have a balanced mix between what Walker calls our emotional gas pedal (our fight or flight inducing amygdala) and brake (our prefrontal cortex). Without sleep the strong coupling between these two brain regions is lost. Otherwise healthy people can experience a neurological pattern of brain activity similar to depression, anxiety, post-traumatic stress disorder, schizophrenia and bipolar disorder if they have their sleep disrupted or blocked. 1 — Set your bedroom temperature at 18 degrees Celsius / 64 degrees Fahrenheit. 2 — Don’t look at devices or blue light (smartphones, tablets, laptops) within an hour of bed and keep light to an absolute minimum (a bedside lamp is 20–80 lux and a living room is 200 lux, suppressing melatonin by 50%. Even 8–10 lux delays melatonin release, making it harder for you to fall asleep). 3 — Brain Dump: Whatever thoughts you have on you in your head, get them down on paper. This can help to clear your head and make it easier to fall asleep. 4 — Have a hot bath, a hot shower or sauna before you hit the hay. Doing so will make it easier to fall asleep as your body begins its cooling down process. 5 — Don’t drink alcohol before bed (you might be able to fall asleep on a glass of red or a glass of whiskey, but the quality of that sleep will be disturbed and you are more likely to wake up as the alcohol wears off) and don’t eat a large meal just before bed if you want to fall asleep and have a good quality night’s sleep. 1 — You make better decisions. 2 — You are in a better mood, less reactive and therefore are a better leader and develop more meaningful relationships with your team, clients and partners. 3 — You are healthier, ergo, you can put more focused energy into the business, for longer. 4 — You are more creative so you can more readily solve all manner of problems that inevitably arise on a day-to-day basis in the innovation domain. 5 — You remember more of what you consume, making you more knowledgeable, supporting — among other things — conversational skills, decision making, creativity and your ability to sell successfully. 6 — You do more ‘deep work’, where McKinsey has found executives to be up to five times more productive than those in a ‘shallow work’ state. To find out more about this eye-opening book and pick up a copy, click here.